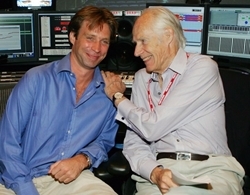 Giles Martin on father George Martin's hearing loss: 'I became his ears when I was quite young' . Beatles Radio: The Beatles, Solos, Covers, Birthdays, News The Fab 4 and More! When Giles Martin, head of sound experience at Sonos Inc. and son of late legendary Beatles producer Sir George Martin, first expressed interest in a music career, his father tried to dissuade him, worried about the comparisons that would inevitably ensue. “My dad talked to me about it when I was 14, so I had already made the decision to defy him quite early on,” Giles tells Yahoo Entertainment. “He did discourage me!” But when the elder Martin, a man who’d based his entire career on his “golden ears,” started going deaf after years of long recording sessions, he turned to his teenage son for help in the studio.